"Anybody who builds a house today is crazy! The minute you start, they put you on the list�the all-American sucker list! You start out to build a home and you wind up in the poor house. And if it can happen to me, what about the fellows who aren't making fifteen thousand a year? What about the kids who just got married and want a home of their own? It's a conspiracy, I tell you�a conspiracy against every boy and girl who were ever in love!" For anyone who's ever endured the headaches, spiraling costs, and endless decision-making of home construction�or for those foolhardy (I mean brave!) souls ready to take the plunge�Mr. Blandings Builds His Dream House is required viewing. It doesn't matter that H.C. Potter's sharp, cynical comedy was made in 1948; the problems the Blandings face remain maddeningly relevant and identifiable today. And with Cary Grant bringing his customary comic flair to the title role, this domestic romp breezes by and maintains its stature as a beloved classic. Jim Blandings is a frazzled ad executive battling burnout, two precocious children, and an overstuffed apartment bursting at the seams. Lured by the slogan "Come to peaceful Connecticut" and the promise of a gentrified country life, Jim and wife Muriel (Myrna Loy) begin house-hunting. An unscrupulous realtor sells them a ramshackle house for a king's ransom, and the financial hemorrhaging begins. A parade of inspectors informs the Blandings their crumbling hovel is beyond repair, so the couple razes the house and starts anew, yet their grandiose plans far exceed their budget. Still, they bite the bullet and forge ahead, only to find themselves at the mercy of various contractors who nickel and dime them over every square foot. Soon the exasperated Mr. Blandings begins to question the merits of the American dream, and worries his dream house will ultimately send him to the poor house. The slick screenplay pokes fun at both the na�ve Blandings and the country workmen who manipulate them like puppeteers. In a bit of social reversal, it's the plain Connecticut folk who look down their noses at the clueless city slickers, and hope to give them a much-needed reality check. Melvyn Douglas, as family friend and legal advisor Bill Cole, levels the playing field with deliciously blunt commentary on the Blandings' adventures. He laces his barbs with a sardonic edge that nicely offsets Grant's sophistication, and his character's standing as Muriel's old flame adds a dash of romantic complication to the brew. Grant proves time and again he's one of the best physical comedians in Hollywood history. With a grace and style his more obvious counterparts lack, he inspires big laughs with small gestures, getting more mileage out of a double take, surprised reaction, or withering glare than most actors do with an elaborate pratfall. Here, he's utterly in his element, spicing his dialogue with a dry wit and bemusement no other actor on the planet can match. He makes Jim Blandings the quintessential everyman and effortlessly draws us into his world. Often dubbed Hollywood's "perfect wife," Loy makes a fine foil, quietly weathering Grant's manic outbursts while providing thoughtful sympathy and support. But just because Grant gets the showiest scenes doesn't mean he monopolizes all the humor. Loy is at her understated best, and a scene in which she tours the house with a painter, meticulously outlining the exact shades of color for each room ("I want it to be a soft green�not as blue-green as a robin's egg, but not as yellow-green as daffodil buds"), remains one of the film's funniest sequences. 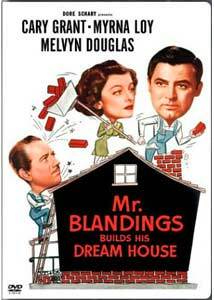 A light yet pointed comedy sure to amuse the entire family, Mr. Blandings Builds His Dream House defies its age, and proves many basic elements of domestic life never change. It may not stop you from constructing your own country castle, but will surely make the process (and its unavoidable stresses) easier to endure. Even those happily ensconced in their current abode will find plenty to laugh about with Grant, Loy, and Douglas. Image Transfer Review: Warner presents another lovely classic film transfer, with the nearly spotless source material providing good contrast and varied gray levels. Only a handful of nicks dot the print, and although blacks aren't quite as inky here as in some black-and-white transfers, they're still rich and vibrant. Edges are crisp but smooth, and a faint grain helps preserve the film-like feel. Audio Transfer Review: The original mono track sounds quite good, with only a few age-related defects occasionally creeping in. Dialogue remains clear and comprehendible throughout, so none of the clever banter is lost. Extras Review: Evidently, Mr. Blandings Builds His Dream House was so popular it warranted two separate radio adaptations produced a mere eight months apart. Warner includes both in a typically stellar extras package, and it's fun to hear the different interpretations. Thankfully, Cary Grant stars in both, and the first version�produced by Lux Radio Theater and pairing him with longtime co-star Irene Dunne�is by far the most successful. Even though Grant and Dunne hadn't appeared together in a film for eight years, they pick up right where they left off, enjoying marvelous chemistry in the hour-long program. And although Dunne's reading of Muriel is more energetic and assertive than Loy's, it's no less successful. The second adaptation (also running a full hour, yet part of the Screen Directors Playhouse series) tells the story of "architects and apoplexy" with equal aplomb, and features the additional novelty of teaming Grant with his real-life wife at the time, Betsy Drake. Unfortunately, the two don't click; Drake can't compete with Loy or Dunne, and her affected line deliveries add a distasteful haughty quality to her Mrs. Blandings. The result is a less lively reading of the story, although the strength of the material and Grant's letter-perfect performance manage to override Drake's lethargy. The 1949 Tex Avery cartoon, The House of Tomorrow, provides a humorous glimpse of the flashy gadgets and gizmos that will grace 21st century homes. A wicked cynicism pervades the 7-minute short, with more than a few pointed zingers directed at mother-in-laws. The colorful animation and many funny bits make this cartoon well worth a look. Finally, a delightful Cary Grant trailer gallery, featuring previews for 10 of the actor's best-loved films (from Bringing Up Baby and Gunga Din to The Philadelphia Story and North By Northwest) completes the extras package. Funny, warm, and smart, Mr. Blandings Builds His Dream House is one of Cary Grant's best comedies, and remains as fresh and lively today as it must have seemed upon its initial release 56 years ago. Warner's solid black-and-white transfer and entertaining supplements enhance this classic film, which will surely become a family favorite. Recommended.